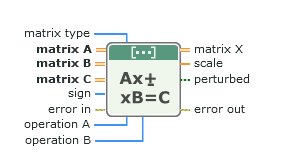 A Boolean that specifies whether this node uses perturbed values to solve the equation. True Uses perturbed values to solve the Sylvester equation. The eigenvalues of matrix A and matrix B are common or close and indicate the solution of the Sylvester equation is not unique. The Sylvester matrix equation has a unique solution if and only if λ ± β ≠ 0, where λ and β are the eigenvalues of A and B, respectively, and the sign (±) depends on the equation you want to solve. When the solution of the Sylvester matrix equation is not unique, this node sets perturbed to True and might not return the correct solution.